The Risberg Memorial Affiliate Grants are awarded by the Conservation Federation of Missouri in honor of David A. Risberg. Only CFM affiliated organizations are eligible to apply. 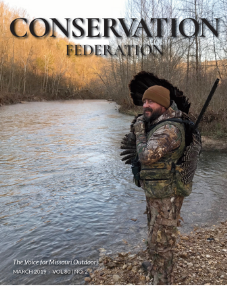 The purpose of these grants is to provide an opportunity for affiliates to take action on conservation by implementing projects funded in whole or in part through this endowment. Provide support for implementing a conservation project. Provide an opportunity for people to take action on a conservation issue or to grow the conservation movement. Provide support enabling an affiliate to implement a conservation program, project or campaign to advance conservation priorities. CFM is awarding $10,000 in 2019. These grants are to support the implementation of conservation stewardship projects by affiliates within Missouri. Grant requests for up to $2,500 will be considered. We anticipate the average grant award will be between $1,000 and $2,000. Partial funding of the amount of the grant request may be awarded by the committee – indicate on the application whether partial funding would be accepted. Each funded project will be required to assemble a description of their project to be presented at the 2019 Affiliate Summit, and a poster presentation of the outcome of their project to be displayed at the 2020 CFM Annual Convention. You may or may not have a representative present to talk about your project. Funded projects will be notified by CFM on or about March 1, 2019. Funds will be distributed upon receipt of signed agreement. Eligible participants include: non-profit organizations, 501(c)3 corporations, or community groups that are affiliates of CFM. Grants may be awarded to small community groups without official 501(c)3 status, but will require a fiscal agent to receive the funds. Only proposals that take place in Missouri will be considered. Preference will be given to smaller organizations with more limited sources of alternative funding. If you are uncertain about eligibility, please contact mgabelsberger@confedmo.org. Native plants for habitat restoration or a bird sanctuary, a butterfly garden, etc. Grantees will be required to sign a grant agreement, submit a final report that includes both a financial and narrative summary, and comply with all terms of the agreement. Projects must be completed by March 1, 2020 and the final report is due within 4 weeks of project completion or equipment/supplies purchase. Final reports should include pictures and copies of publicity/news articles (if applicable). Send in one or two photographs or images (if available) that capture the project, plan or group involved in the proposal. (This will appear as part of a project profile on the CFM website). Download and complete the application, which requires information in the following areas. Project description: Give a detailed but concise description of project objectives, activities, and associated timeline (grant funds available as early as March 1, 2019 and projects must be completed by March 1, 2020). Fiscal responsibility: Identify the grantee fiscal agent and signature authority for grant agreement, and list nine-digit Federal Tax ID Number. Provide contact information for the signature authority. CFM must be recognized as a funder of your project in any media or marketing related to your funded project. Ongoing projects may not be funded once they’ve been funded for more than 2 consecutive years. This will allow CFM to diversify the projects we fund. February 16: Applications for grant proposals close. All proposal materials are due. Scan and email to mgabelsberger@confedmo.org or mail (must be postmarked by February 16) to 728 W. Main, Jefferson City, MO 65101. March 1: Proposal Review Committee completes application review and makes grant awards; all applicants will be notified about grant status within two weeks thereafter. March 15 – April 30: Checks will be mailed to recipients upon receipt of signed grant agreements. March 2020: Grant recipients from 2019 showcase their projects at the 2020 CFM Annual Convention. Go to www.confedmo.org to familiarize yourself with CFM’s vision, mission and values.